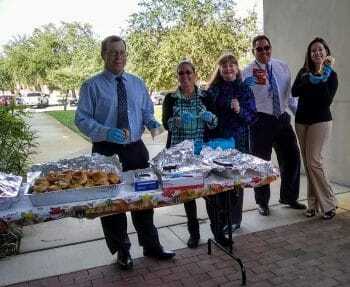 The Daytona Beach campus faculty and staff hosted a Thanksgiving-themed Portico Party with fun, music, and a menu of turkey sandwiches, snacks, and pumpkin pie. During the event, Dr. Champlin, Campus President, and the “New Ideas Committee” awarded five full Thanksgiving dinners for campus students to enjoy during the holidays. Although the weather was brisk, the start to the new “Fall D” start was both warm and welcoming.